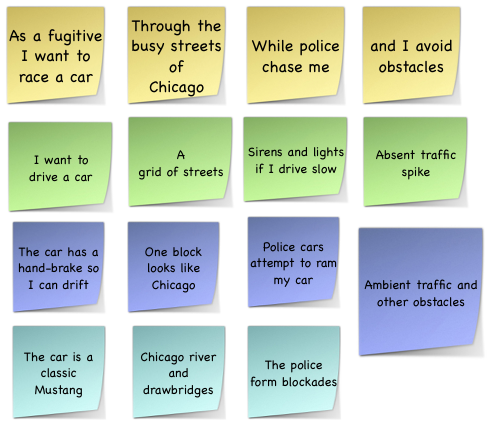 This article explains the basics of User Story Mapping and provides a simple example. Years ago, I attended a lecture from Jeff Patton on User Story Mapping. I was intrigued by his example, but struggled with how to apply it to video games. Then, last year, he published his book on the topic. The book is a great resource on different approaches and examples for mapping. About this time I had a chance to mapping with a mobile game team. Our variation on mapping worked well. arranged by priority or a narrative of user activity on the horizontal axis. The vertical axis often groups stories by sprints or releases (time). "You are a fugitive driver, being chased, avoiding traffic and using your driving skills to escape Chicago!" This is a good goal and a sizable chunk of work. One of the first steps in release planning is to break the BHAG down into some smaller epic stories (stories still too big to fit into a sprint). As a fugitive I want to drive a car fast to evade the police. As a fugitive I want to avoid obstacles so I can keep ahead of the police. As a fugitive I want to use the busy streets of Chicago to lose the police. This isn't the only possible arrangement of the narrative, but for this example, I arrange it this way to highlight the priority of the epics. Obviously, driving the car is the most important. It wouldn't be much fun if you can't evade the police. Avoiding obstacles would be nice, but less important than the city and police. 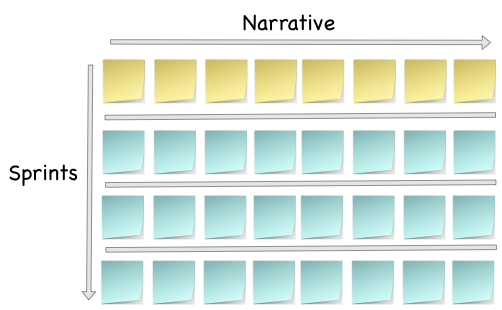 Also note that the narrative isn't a set of user stories following the user story template. The reason is that we want the narrative to be clearly readable as a whole tightly-coupled story. The template can get it the way of doing that. Placing them into their appropriate sprint (row) under the narrative epics (column). The colors represent the sprints (rows) for forecasted sprint goals. The purple post-it in the lower right is large because it's still an epic. We'll split that up after the spike (experimental work) on the ambient traffic in the previous sprint gives us a bit more knowledge about the work involved. It visually organizes the work for a release. I love the big picture view. This can be used on games with a hundred people to give everyone a clear view of the shared goal and progress. The narrative communicates "why" we are working on the stories. I've noticed that teams using a map will respond to emergence better because they understand the big picture. It's two-dimensional. The one-dimensional view of a traditional product backlog is limiting. Having multiple dimensions is better at handling prioritization. It's very customizable. For example, if you want to map a dependency, you can tack a piece of string or ribbon between two stories. It responds to change very well. We can shift stories, priorities and how work might be shared very quickly. Build your maps with as many people as you can. If you have 100 people on your team, have teams map out their columns individually. This helps build a shared vision. Physical boards trump tools! I feel I'm a broken record on this, but maps don't take much space, radiate information and can be instantly customizable and modified (sorry distributed teams). Don't use post-its. Although I use them in the art above, these maps live for months. Index cards and cork boards, etc. work better.